The Eagle's Roost is located on a limestone bluff approximately 300 FT above the beautiful White River with absolutely amazing views. The name for this vacation house was chosen due to the large number of Bald Eagles that frequent the immediate area around the house during the mating season. They circle and frequently roost on dead tree snags on the property. The house is perfect for your private getaway, gracious wedding, honeymoon, or family vacation. The large 'family room' provides entertainment with a wet bar, foosball, and pool table topped with an amazing view of the valley from the second floor. The Eagle's Roost is ideal for your family reunion! Regardless of all the great amenities the reason you will love the Roost is THE VIEW...JUST AMAZING..THE SUNSETS UNBELIEVABLE.and the privacy...no interruptions by the jangling of a telephone. ;.our cabins and vacation homes do not have them. Bring your cell if you need a phone. COME SEE US..WE WILL LEAVE THE LIGHTS ON FOR YOU! Please contact us concerning pets before booking. Pet fee is determined by the number of pets and size. Keywords: Luxury Vacation Home. A great place for a fabulous Honeymoon, Reception, Family reunion. A large double door refrigerator is in the main kitchen area. A second refrigerator is located in the utility room just off the kitchen. A third, under the counter frig is located in the game room. The main deck is 80 FT long with absolutely breathtaking views of the river and valley. The deck has a 16FT enclosed hot tub area ( screened) for your enjoyment. Your private hot tub is located on a covered and screened deck with awesome view. The perfect cabins for a family vacation or couple getaway. Located on a bluff 400 feet over the valley floor offering a breath taking view. Enjoy the view and watch the Bald Eagles as they fly by your deck. Adventure at every turn, Zip Lining, Stand Up Paddle Board, Scuba Diving. Visit the Eureka Springs historical district. Original buildings and sidewalks from 1800's. Our luxury cabins have dishwashers, microwaves and washer and dryers as well as wifi. 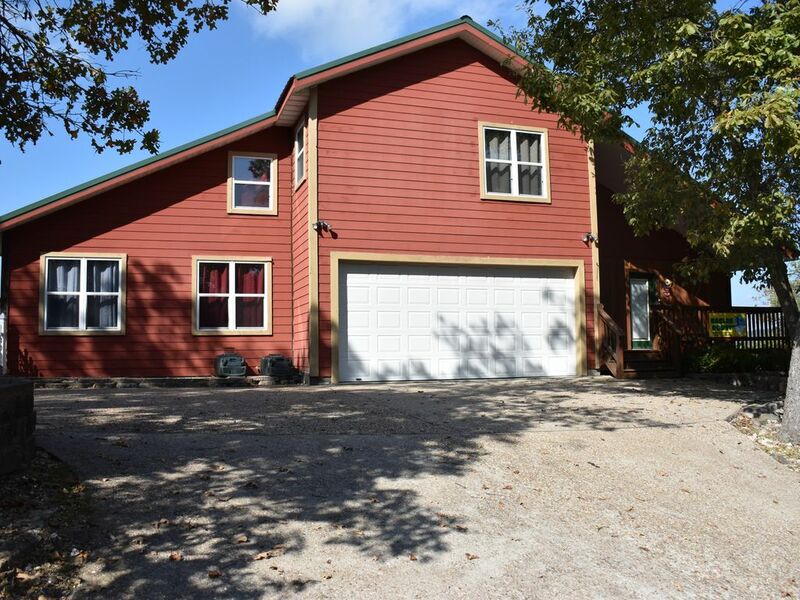 Located 5 miles west of downtown and 5 miles east of Beaver Lake we are centrally located in all Eureka Springs has to offer. Spend your days exploring Onyx Cave or Cosmic Cavern, Turpentine Creek Wildlife Refuge, ride the NW Arkansas Railway Train, enjoy shopping in over 200 unique shops, diners delight with over 100 choices. When the day is done return to your cabin nestled in the quiet and relaxation. Bring the whole family or enjoy a romantic getaway. Everything was top notch! Great location with a view that can’t be beat. Love this beautiful cabin! And the property was gorgeous! Had a wonderful family get away for the weekend in this awesome cabin! The property and river behind the cabin is gorgeous and Eureka Springs was so fun to shop around! This cabin has tons of charm, plenty of amenities, and was super clean when we got there. Also, the kitchen is super easy to cook in! No problems and easy check out! We would highly recommend this cabin and we will be back!! I had to manage 10 women for a weekend, and this place was the perfect place to do it! We all slept comfortably and had everything we could ever think that we'd need! Don't over pack things, because this place has everything you need to have an amazing weekend! The back porch views alone made this the most worthy spot. The hosts were super helpful and available but never intruded. The location is so close to Eureka that even the limo taxi services come out. 10 out of 10 girls loved this cabin/eureka mansion, and 10 out of 10 said they'd try to plan something else to be able to come back! Wonderful spot! Great view. really nice place. lots of space for families or groups. Would stay here again!!! It was perfect. There were 5 of us so we had our own bedrooms. The view from the back deck! It was perfect. There were 5 of us so we had our own bedrooms. We had plenty of room to spread out. The back deck was wonderful with such a great view! We loved it and will definitely stay here again! Gorgeous property with very nice accommodations and amenities. The view was amazing and there was a ton of room for our group of 10. Only minutes away from Eureka Springs and all the outdoor adventures such as hiking, canoeing and fishing. The property manager Carla is very attentive if you need anything! We would definitely stay again. Thank you for your kind words. We are always happy to know our guest enjoyed their stay. Thank you for being great guest. We hope you return to visit and we always offer a repeat guest discount. Eagle Watching during the months of November thru March the Bald Eagles frequent the area around Eureka Springs including several dead tree snag where they sit while waiting for prey.